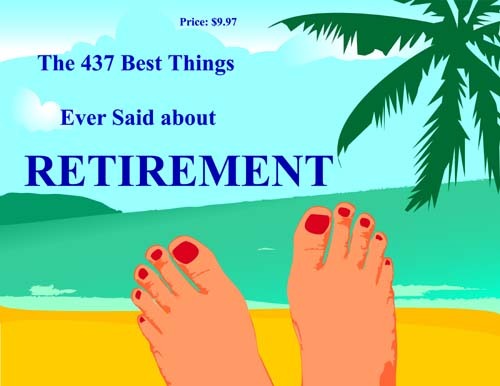 Over 14,000 Listings for Retirement Books! Don't wait for retirement to be happy and really start living. Invariably, people who try this find out that they have waited much too long. I’m now as free as the breeze — with roughly the same income. One of the best hearing aids a [retired] man can have is an attentive wife. Retirement: The time in your life when time is no longer money. I have retired, un retired, and retired again all in the past 10 years. Heaven, that’s my retirement plan. I’m retired. You on the other hand have to go to work. The money’s no better in retirement but the hours are! In a corner, by the fireside, with your slippers on your feet? It's All in How You Play the Game, Isn't It? Let's see now. How will I know when I am a senior. My government pension will be sent to me when I am 65. So that means that parts of our society think 'senior' begins at 55. How will I personally know? Well, with a little bit of luck, I don't think I'll ever know. Home art gone and ta’en thy wages. F R E E E - B O O K ! When you see some people work you wonder what they’ll do in retirement. He who laughs last at the boss's jokes probably isn't far from retirement. This letter comes from Blake Wheaton who wrote to me in March 2006 from Burleigh Waters, Queensland, Australia. 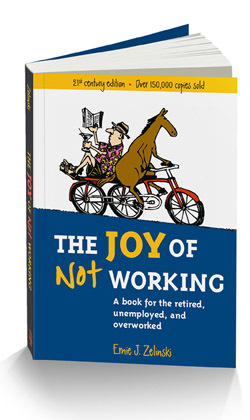 I enjoyed reading "The Joy of Not Working" and "How to Retire Happy, Wild, and Free." Both have been important books for me. I'm 55 and have worked continuously since I was 11 delivering The Montreal Gazette before 7 a.m. I have lived in Queensland for 31 years and have taught high-school science all that time. Your focus on "purpose" has hit home. I still find purpose in teaching but have decided to cut back to part-time to free up time (especially weekends). Thanks for helping me arrive at that decision - your books have been almost like a sounding board and I'll read them again. What does a government retiree miss most about not having a job? Not being able to call in sick two or three times a month. How many retirees does it take to change a light bulb? Only one, but it will take him two or three days to complete the job. What do you call a worker who is of retirement age, hates his job, and refuses to retire? When is it a retiree's bedtime? Two hours after he falls asleep on the sofa. What is the typical retiree's greatest frustration? Not being able to complete all the things he had planned to do that don't need to get done in the first place. What is the typical government retiree's idea of intense physical exercise? More Retirement Sayings, Retirement Quotes, Etc. — Alexander Pope (1688–1744), English satirical poet. games on the weekends to go play in tennis tournaments. One of the problems of retirement is that it gives you more time to read about the problems of retirement. is a calendar because there are so many things to do. Now I encourage people to retire — the younger the better. Sixty-five is the age when one acquires sufficient experience to lose one's job. Before deciding to retire from your job, stay home a week and watch daytime television. Truth be known, you can retire today and work a few hours a day when you want to, live anywhere in the world you choose, and earn a six-figure annual income. This short letter about comes from Mavis Marko in Saskatoon, Saskatchewan. 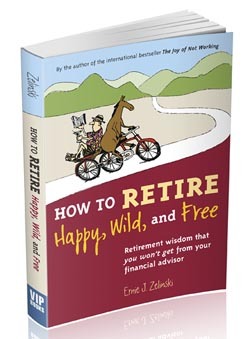 I enjoyed your book "How to "Retire Happy, Wild, and Free." It sure is "Retirement Wisdom That You Won't Get from Your Financial Advisor." I am going to give it to her to read next. I can't wait for another book by you. Have a great fall and winter. Welfare is not a retirement plan. like early retirement is a gift, but it's such an incredible gift. It's a gift I need to use. 1. You are more independent and more creative than most people. 2. You were born a lover of life and not a workaholic. 3. You don't want the cheese; you just want to get out of the trap. 4. You like books that are reader friendly with lots of cartoons, quotations, and exercises. 5. You like books that make you smile and challenge traditional ways of living and thinking. 6. You agree with the words of Bertrand Russell: "To be able to fill leisure intelligently is the best product of civilization." 7. You are receptive to the concept that we can achieve more if we relax, enjoy life more, forget about what the majority in society thinks is important, and focus on the things that really matter. 8. Your parents and co-workers will not approve of your adopting this book as your lifestyle Bible. 9. You know a good deal when you see one — if a book has been published in 17 languages in 21 different countries and has sold over 300,000 copies, it must have great value. 10. You know something important that the hard workers of this world don't know: The secret to a happy and fulfilling life is to work smart and not hard — just like Ernie Zelinski does! This letter was written to me in March 2007 by Ayumi Nakabayashi in Osaka, Japan:. I have just read you The Joy of Not Working and I'm writing to thank you. I'm a single working mother with twin daughters. What this means is I'm a poor miserable woman in Japanese society, so I am always worried about money for the future more than necessary and never enjoying my present life. This book gave me a different view of my life, which I should pay attention to. I don't earn much money but enough to live, and have free time to enjoy. I feel excited about thinking how to spend my free time now. I'm making an "Idea Tree" [Get-a-Life Tree] after writing this letter. 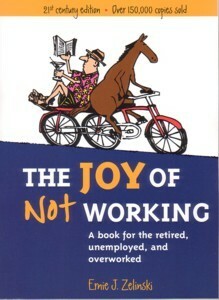 To read The Joy of Not Working in English is on the top of the list! I have forgotten that I have a lot of things I want to do. This book gave me a chance to think over the relationship with boring people, too. I'm sorry I don't have enough words to explain how I feel now in English, but I really appreciate you. "That's good to know because I'm getting married in two weeks," said the retiree. "Getting married! That's wonderful! Who's the lucky bride?" asked the doctor. The retiree replied, "She's a 27-year-old bar maid I met at the local pub." "Only 27!" The doctor paused before he advised, "Then you will need some Viagra." The man replied, "No way, I never take drugs of any type. It's against my principles." The doctor took some more time before he responded with: "You are in good shape, but nevertheless you are 93. May I suggest that you and your wife take in a boarder?" "Why a boarder?" asked the retiree. "Well, you know, at your age," winked the doctor, "you may not be able to do all the things a young woman would like a husband to do around the house. A boarder will be able to help." The retiree shrugged and said, "I guess you are right," as he walked out of the office. A year later, the retiree, now 94, came back to the doctor for another checkup. "How's married life?" asked the doctor. "Amazing, it couldn't be better. I should have remarried years ago." "How's your wife?" asked the doctor. "She's doing fine," announced the retiree, "and she's pregnant." "Pregnant!" exclaimed the doctor. "I take it that you took in a boarder who has fit in quite well?" "'Yes, and she's pregnant too," grinned the retiree. Sanders was a friend of chickens. When some people retire, it's going to be mighty hard to tell the difference. he or she has retired? How to Retire Happy, Wild, and Free. I forgot the other 8. The worst thing about retirement is having to drink coffee on your own time. The key to a happy retirement is to have enough money to live on, but not enough to worry about. — Javier Pérez de Cuéllar (b. 1920), Peruvian diplomat, Secretary-General of U.N.
you knew it — and with that a cold wind blows across the landscape? No longer having to punch a time clock is my definition of retirement. That way I could do what I want — when I want — anytime I want. very high, his retirement program is, you might say, out of this world. There are a lot of books telling you how to manage when you retire. What most people want is one that’ll tell them how to manage in the meantime. play at the things you want to work and play — all at your own pace. 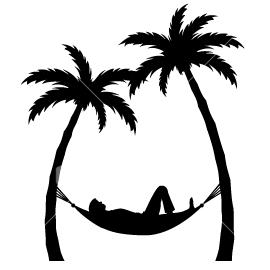 I'm retired — goodbye tension, hello pension! Most people perform essentially meaningless work. When they retire that truth is borne upon them. Lord Tyrawley and I have been dead these two years, but we don't choose to have it known. Eating's going to be a whole new ball game. I may even have to buy a new pair of trousers. — Lester Piggott (b. 1935), British champion jockey. On his retirement. Forget how old you are — this gets more important the older you get. Enjoy every retirement day as if it was your last and one day you will be right about it. The great thing about show business is that there's no mandatory retirement age. this [job] to be work. I pant for retirement and leisure, but am doomed to inexpressible and almost unsupportable hurry. The gradually declining years are among the sweetest in a man's life. To retire is the beginning of death. In this country . . . men seem to live for action as long as they can and sink into apathy when they retire. — Charles Francis Adams, Sr.
Three sons left home early in life, went out on their own, and all three prospered in their own ways. Getting together one day, they discussed the gifts they recently gave to their elderly retired mother. The first boasted, "I bought mom a Mercedes limousine and even hired a chauffeur since she can't drive. The limo alone cost over $150,000." The second replied, "I had a big mansion built for mom. It's worth well over $500,000." The third smiled and wryly proclaimed, "I've got you both beat. Remember how mom enjoyed reading the Bible? Of course you know she can't see very well. I sent her an awesome parrot that recites the entire Bible. It took elders at a church over fifteen years to train him. He's one of a kind in this world. All mom has to do is name the chapter and verse, and the parrot recites it. I paid more for the parrot than what the two of you spent on the house and limousine." Not long after, the elderly mother sent out her letters of thanks, with a particular mention of how much she liked each the gifts. of the time, so I rarely use the Mercedes. The driver does nothing most of the day. Besides, he is a bit rude!" "Todd," she wrote to the second, "the house you had built for me is so huge. I live in only one room. It takes me a whole day to clean the whole house." to know what your mother truly likes. Although a bit more work in preparing it than I am used to, the chicken was delicious." Retirement is a time to make the inner journey and come face to face with your flaws, failures, prejudices, and all the factors that generate thoughts of unhappiness. Retirement is not a time to sleep, but a time to awaken to the beauty of the world around you and the joy that comes when you cast out all the negative elements that cause confusion and turmoil in your mind and allow serenity to prevail. I think it [retirement] beats the heck out of life after death, that's for sure. The company gave me an aptitude test and I found out the best work I was best suited for was retirement. I like retirement life. It's something to do when no one wants you to work anymore. morning of the day when you find you have enough money. Retirement: When you have given so much of yourself to the Company that you don't have anything left that the company can use. the decisions I made in the past. That I made in my life.